ALLEN, Texas (March 11th, 2017) – Altera Development Company LLC (“Altera”) has closed and has commenced construction on a new four-star, full-service Delta by Marriot Hotel with an attached convention center to open in Allen in late 2018. 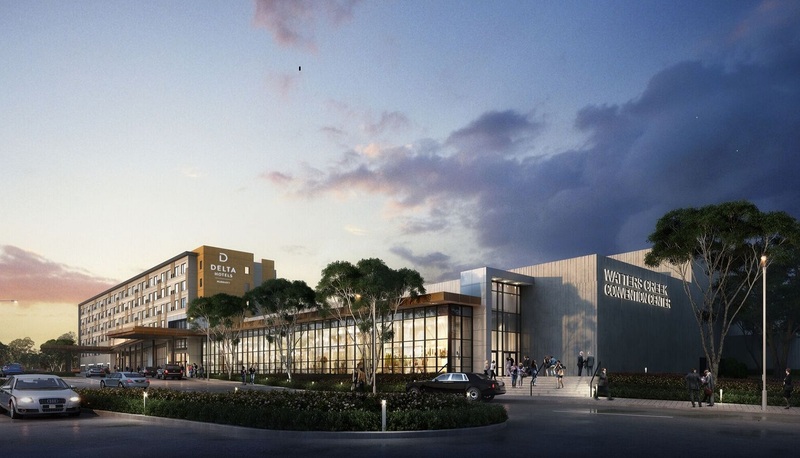 The project will feature 300 guest rooms, 90,000 square feet of flexible convention, ballroom, and meeting space and 1,000 parking spaces, making it one of the largest facilities of its kind in North Texas. Located steps away from mixed-use center Watters Creek at Montgomery Farm, visitors will enjoy easy access to a variety of high-end shopping and dining options. Delta by Marriott is Marriott’s newest upscale, full service hotel brand. The 300 premium guest rooms will feature a fresh, streamlined design. An upscale restaurant and a destination bar, located adjacent to an outdoor courtyard with swimming pool, are designed to allow guests to meet, entertain, and unwind. The Delta focus on upscale essentials includes a 24 Hour Elite Pantry, a fitness center with cardio, weights, yoga and crossfit, free WiFi, and bottled water available on every floor. “This convention center is truly a unique asset for north Texas,” said Allen Mayor Stephen Terrell. “The sheer size of the convention space opens the door for significant conferences and propels Allen to a whole new level as a destination city for business and tourism.” The City of Allen, Allen Economic Development Corporation and Allen Community Development Corporation are jointly investing in the project. “The new convention center and hotel will provide the City of Allen with the capability to host larger meetings, sporting events, trade shows and conferences, generating revenue and tax dollars that benefit our community,” said Karen Cromwell, Director of the Allen Convention & Visitors Bureau. The Allen Convention & Visitors Bureau, which brings a wide range of events, organizations and visitors to Allen, will relocate to the facility. Located just north of Dallas off U.S. Highway 75, Allen combines the big city amenities with small-town hospitality. Meeting planners will find sophisticated conference services and spectacular climate that allows for year-round recreational opportunities, including the exceptional Golf Courses at Watters Creek. Entertainment venues, outlet shopping and great dining draw both business and leisure travelers. Allen is located within 30 miles of Dallas Fort Worth International and Dallas Love Field, with McKinney National Airport eight miles to the North. The Allen Community Development Corporation (ACDC) is funded through a citywide half-cent sales tax and is charged with overseeing the funding for land, buildings, equipment and improvements which are suitable for professional and amateur athletics, entertainment and tourism, parks and public spaces, transportation and other projects which promote new or expanded business enterprises. BENCHMARK®, a global hospitality company, is a trailblazer in the development, management, marketing and owner-advisory services of resorts, hotels, conference centers and exclusive private clubs. BENCHMARK’S distinguished and proven reputation is deeply-rooted in core values that are focused and aligned with exceeding ownership and stakeholder performance expectations. The combined portfolios feature nearly 70 unique and distinctive properties domestically and internationally, with a passionate commitment to delivering the industry’s most authentic, enchanted, soulful, vibrant, unrivaled and memory-making experiences. BENCHMARK, a global hospitality company, is based in The Woodlands (Houston), Texas, with regional offices in Park City, Utah; Miami, Florida; New Brunswick, New Jersey; Seattle Washington; and Tokyo, Japan.